What if you could visit a locally owned establishment, get the same great food and service but have a different experience every time? Well, that is exactly what you get with Tipsy Piano Bar. Like many businesses, Tipsy thrives because of the quality of its staff and the experience they create. 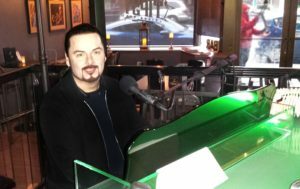 Their three regular pianists, who have been playing there since they opened last August, are as varied and distinctive as the menu, creating a truly unique experience in downtown Olympia. Playing a piano bar takes a certain kind of tenacity and drive. Having the ability to play a variety of music genres spanning several decades and engage an ever-changing audience provides a unique challenge for area pianists. But as I learned by talking with each of the regulars, this is exactly what they love about Tipsy. It offers them a fun and challenging way to grow their repertoire of music and interact with locals. 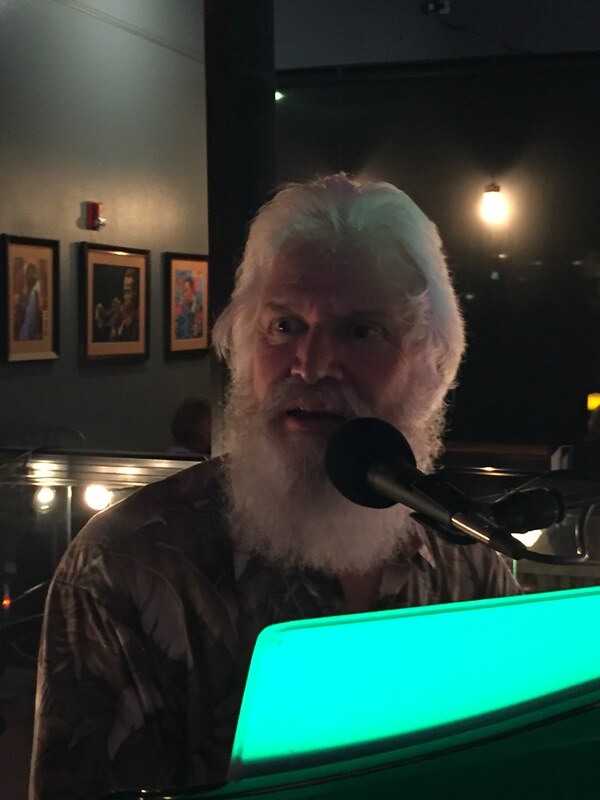 If you took your sweetheart to Tipsy on Valentine’s Day, you had the opportunity to experience Charlie Saibel, a retired state employee, at the piano. Charlie has lived in Olympia most of his life and has been playing music semi-professionally since high school. Rooted in bluesy jazz music, he now enjoys the mandatory versatility that playing at a piano bar demands. Charlie says his music is evolving because of his work at Tipsy. He loves the one-on-one relationship created between the music and patrons. For a mid-week treat, you can find Chris Avila putting his modern twist on the typical piano bar music with his Yamaha keyboard complete with drum beat. Chris, a bit of a jack-of-all-trades, is a self-taught musician and has been playing since he was 10-years-old. 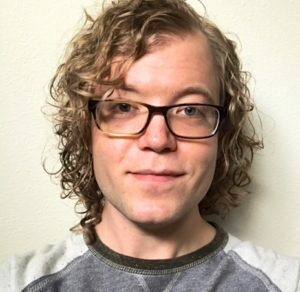 Since his family couldn’t afford lessons, he learned to “feel the music through his hands.” Chris doesn’t use sheet music or have a favorite song. Instead he uses tactile memory to play songs as he hears them and infuses his personality into each one. After many years working with bands, Chris is really enjoying the ability to use his keyboard to engage audiences hour after hour. The opportunity for customers to sing along and really experience a place keeps him coming back week after week. And if Friday or Saturday night is more your speed, that is when you will usually hear Michael Larson playing many of your favorite contemporary songs. Michael started playing piano before he can even remember, around four-years-old he was told. “The piano is just part of who I am,” he says. Some of Michael’s favorite memories from his time at Tipsy so far include playing the Halloween and New Year’s Eve parties. But he recalls his most powerful memory playing “Hallelujah” by Leonard Kohen. “The whole room came to life,” Michael remembers. “Everyone came around the piano and started singing in unison.” In addition to these brief, but special, unpredictable moments keeping Michael eagerly at the piano, he truly enjoys interacting with people and hearing their stories. At the end of my interview with Michael, he shared the irony of playing Billy Joel’s Piano Man as his audition piece for Tipsy last year. The line “forget about life for a while” from the infamous song, resonates with the experience being created right here locally. Tipsy has created a unique space with a great vibe offering diverse patrons, regulars and first-timers alike, a place to take a break from it all and simply enjoy the moment. Date night? Girl’s Night? Guy’s Night? Any night! 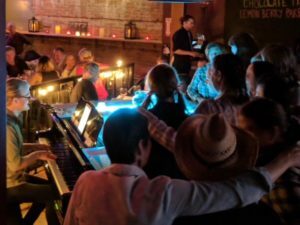 No matter the occasion, Tipsy is serving up live music, signature cocktails and great food in their “swanky but chill” downtown location. Most weeks you can catch Charlie Wednesday evenings, Chris on Thursday, and Michael rounding out the week on Friday and Saturday nights. So, stop in and forget about life for a while. For more information and live music updates, call 360-915-7181 or follow them on the Tipsy Piano Bar Facebook page.